One of my first sewing projects was a full-length velvet cloak lined in satin. That was a bad idea for a several reasons, one being the sheer size of the thing. In theory, a cloak is easy to sew. In reality, it’s about 15 yards of fabric to maneuver through the sewing machine. Also, you have to spread the fabric out on the floor to cut it unless you are sewing at the Jolly Green Giant's table. Accurately cutting out fabric pieces while crawling around on your hands and knees is challenging and not at all fun. My cloak turned out... less than perfect. Actually, it was terrible. I should have started small. 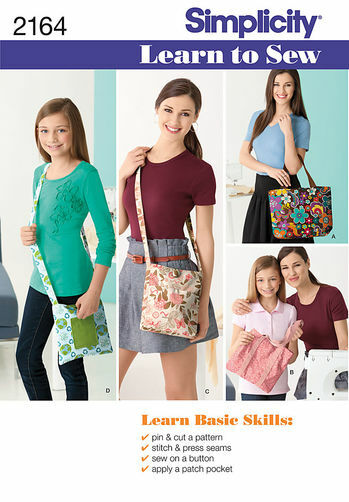 I suggest a tote, top or short/mid-length skirt for your first two or three projects. Smaller pattern and fabric pieces can be cut on a normal-size table and are more manageable while stitching. Simplicity 2286 – a “Learn to Sew” pattern for a 16” long skirt with elastic waistband. Ah! Thank you! I've been looking for a peasant top pattern for ages.